← Yubico Yubikey: Solution for Flash Drive Encryption? Posted on February 18, 2011 by Jill B.
We’ve all seen our share of crazy flash drives. Manufacturers, artists and peripheral lovers have created USBs using just about any shape and material you can imagine. As a user, you value each custom flash drive for its novelty and ingenuity. Bet you never thought of throwing one away, right? With one new concept, it’s actually encouraged. 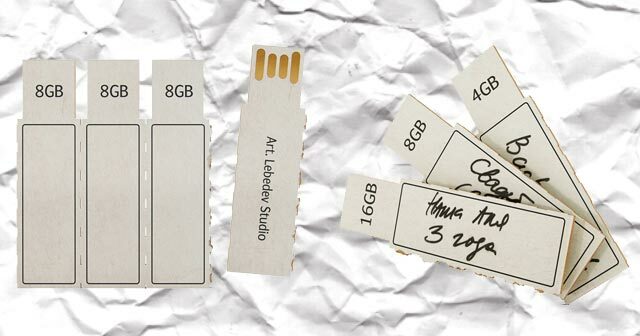 Russian artists Alexei Lyapunov and Lena Ehrlich under direction at the Art Lebedev Studio dreamed up disposable cardboard USB flash drives dubbed Flashkus. They are featured in a perforated cluster that can be separated from one another for use. The simplicity of these concept-only drives may have them spreading like wildfire among manufacturers looking to make their own versions or burning up in flames as a thumbs-down, bad idea. As a result, let’s weigh the pros and cons of a disposable flash drive. – Inexpensive to produce. Cardboard is a more cost-effective material than plastic, wood or metal. It wouldn’t require using costly inks to decorate and customize. The outside of each drive could be written on as needed for its own specific purpose. As a result, it would be cheap to users. – Easy to carry and distribute. Cardboard flash drives are as portable and lightweight as they come. They could be passed out at tradeshows, in the mail or even to students in a classroom. It would also be a simple way to exchange information with family, friends and clients without feeling the need to get the flash drive returned in the same way you would need a non-disposable drive. – Environmentally friendly. The cardboard USB’s biodegradable housing would cut back on the amount of electronic waste consumers go through. – Provides a fresh concept. Cardboard flash drives show that you don’t have to reinvent the wheel to make portable storage work for you. A change in material can do the trick to make USBs exciting, novel and multifunctional. – Sensitive information could be at risk. You can delete your data from sight, but not completely from the memory itself. Short of absolutely obliterating the drive, users with enough computer know-how can recover information you may want to keep private from a disposable cardboard USB. – Potential lack of durability. Since these flash drives are made from recyclable, biodegradable cardboard, they might not be able to stand up to the same wear and tear as a generic plastic USB drive. – Limits for custom printing and design. Due to the flimsiness and surface of the material, there would be fewer inks, films and printing equipment may be compatible with these drives. Any elaborate artwork may be up to the artistic hand of the user. Can you think of any more pros and cons to the Lebedev disposable cardboard flash drives? Would you use them or would you pass them up for something with a little more substance? Talk to us! This entry was posted in Articles, Custom Shaped USBs, Custom USB Flash Drives, Flash Drive, USB Flash Drives, USB Future and tagged Alexei Lyapunov, Art Lebedev Disposable Cardboard USB Flash Drive, Art Lebedev Studio dreamed, Cardboard USB Flash Drive, custom flash drive, disposable cardboard USB flash drives, disposable flash drive, Lena Ehrlich. Bookmark the permalink. It is a good idea and a bad idea ,but for it’s good side I would like to try it out for two or three months to see if it is as good as I hope that it can be. of these new and novel products. these are a great idea and there are actually no cons to these represented in this blog. first of all if sensitive information is at risk then you shouldnt just use a regular usb drive to store sensitive information or use a usb drive at all. second, if youre so worried about the potential lack of durability then you shouldnt buy DISPOSABLE usb drives. durability shouldnt be that big of a factor since its disposable. when have you ever bought a disposable camera and kept it for over a month. third and lastly limiting the customization isnt even a factor because since they are disposable you wont be looking at it for a long time.